The CDC’s Youth Risk Behavior Surveillance System (YRBS) has provided data on health-related behaviors of U.S. high school students for over 25 years. Results have been used to monitor progress toward national health objectives and to support the modification or development of programs and policies that promote health among high school aged youth. Individual school districts across the country have recognized the utility and power this type of data provides and many choose to implement local-level versions of the YRBS (or other similar type of student health survey). Most districts hire external contractors or organizations to conduct the data cleaning and analyses of their local data. Many districts also use external contractors to generate summary reports, tables, and charts. But even with external help it can be overwhelming to decide how best to examine the results. Here we briefly illustrate one of the most powerful ways to explore student health survey data, the trend over time. Our goal is to provide some useful suggestions for exploring and reporting data from your own surveys so that you can be better informed on the health needs of your students. Here is a simple table of results that shows the rate of one risk behavior among all students over three different years. In this format it is easy to see and report if the rate of the behavior is increasing or decreasing over time. In our example, the rate of marijuana use in the prior 30 days has declined from nearly 27% in 2012 to about 19% in 2016. You can also visualize this data in a very simple bar chart, as shown below. You can opt to add some text boxes that highlight extra information that might be important for your audience to understand about the data such as the state rate, total number of students surveyed, etc. In this example, we added the approximate number of students the current year’s rate represents. We find this is often helpful when trend data show a decrease over time because it’s easy to forget you are talking about actual students in your school. So highlighting how many students are still at risk is a good way to balance the ‘big picture’ with the real personal value of the data. Examining the overall trend in your data is absolutely the essential first step. However, the trend you see might not represent what is going on for all sub-populations of students! For this reason, we highly recommend exploring and comparing the trends among sub-groups of students to gain a more accurate picture of the health of your student population. Here is a second table of results that shows the rate of one risk behavior over three different years and stratified by grade level. In this format it is easy to see and report if the rate of the behavior is increasing or decreasing for each sub-group. In our example, the rate of marijuana use in the prior 30 days has steadily declined between 2012 and 2016 for 9thand 12th grade students. But the rate has increased since 2012 among 11th graders and it has increased since 2014 for 10th grade students. Had we stopped exploring our data after looking at the overall trend, we would have missed this very important finding! Visualizing the trends by sub-group can really help you ‘see’ the differences, particularly when many years of data make reading summary tables full of numbers more difficult. 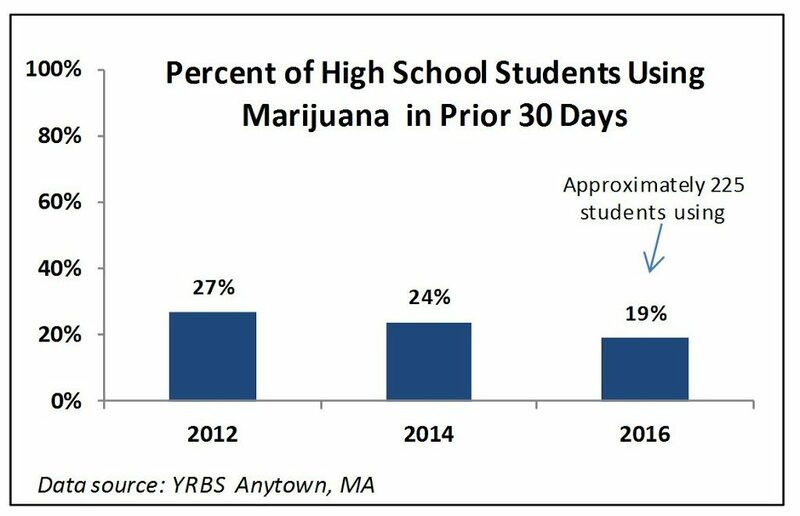 In our example below, the dramatic drop in 30-Day marijuana use among 9thgraders is very clear. Likewise, you can easily see the steady decline in use among 12th graders. And the less encouraging results for the 10thand 11th grade students are shown in a more understandable way that can foster discussion with stakeholders or audiences. Trend data is one of the most powerful ways to explore your student health survey data. But overall trends may be hiding some very important differences between sub-groups of students. At ICH we always encourage school districts to look at data trends by grade level and by gender. Additionally, for districts with a diverse student population looking at data by race/ethnicity is also important. Ultimately, the goal of collecting YRBS or student health survey data is to inform programs and policies that will improve the health and wellbeing of all students. We hope that our suggestions here will help you achieve that goal. 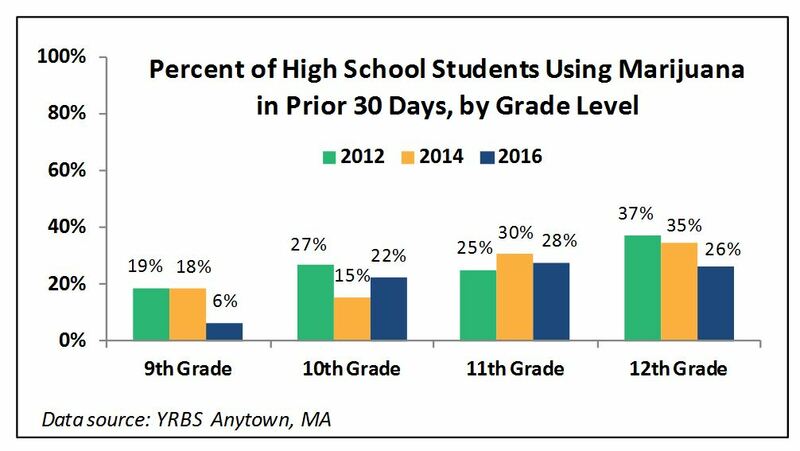 ICH has supported the development and implementation of both middle school and high school student health surveys in multiple school districts in MA. We have also provided technical assistance to numerous school districts, public health agencies, and substance abuse coalitions around the analysis, interpretation, and dissemination of survey results. Our goal is always to aim for results that are understandable, useful, and actionable and this has led us to explore many different ways to visualize student health survey results over the years.